Corrine Oliver, simply one of the best and most in demand singers in Scotland. Fact. As everyone knows, hireaband rejects more acts than we ever agree to work with because of the high standards of performance we demand both on and off stage. When Corrine approached us and asked us to work for her we agreed without a seconds hesitation. Her reputation as an outstanding performer and a first class professional meant that we took the rare step of signing her unseen - and when we did see her show our reaction was Wow! What a show! We're convinced that it's only a matter of time before she goes big time - the labels and promoters are already circling so book her for your next event while you can. 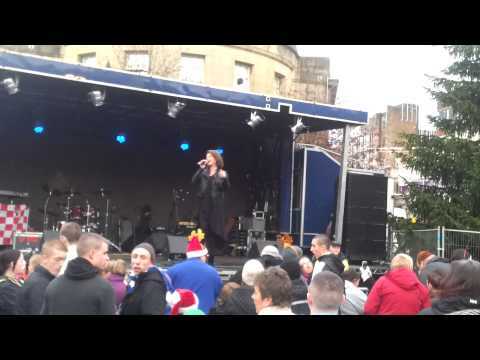 Corrine is widely recognised as one of the most reputable and in demand singers in Scotland. Over the past decade she has performed at hundreds of venues and has become a favourite in the Wedding, Function and Corporate Markets up and down the country. If you want the best in vocal entertainment for your event, then no look no further. Boasting a huge repertoire of songs, Corrine has the rare ability to sing a wide range of musical genres. Be it Rock l Pop l Soul l Disco l Motown, you name it, this girl can sing it! She is a consummate professional and a down to earth girl who puts her heart and soul into giving each and every audience a powerhouse performance. Corrine is simply a natural talent who will captivate you from the word go and keep your dance floor full all night long. Corrine is a fully self-contained act with an impressive sound and lighting rig to suit any venue, big or small. She also has her own sound and light engineer to ensure the best in entertainment at all times. This show is complimented well with a DJ for between Corrine's sets to keep the party atmosphere going! Alternatively, background music can be played for the duration of the evening buffet. Corrine said "Hireaband are the natural choice for ambitious professional entertainers. Their reputation for organisation is second to none. I know they treat my clients with respect and courtesy and I'm delighted to have them working on my behalf." Enquire Now for a free quote and availability check, or add Corrine to your shortlist of favourites. Sorry, Corrine Oliver doesn't have any photos right now Send us an enquiry and we'll get back to you, or check out the rest of the act profile. Just writing to thank you all at Hireaband for the excellent service we recieved with our booking. We booked The Corrine Oliver Show for our 50th Wedding anniversary on 18th October and we were delighted. Everything was just spot on- from the website to the agency to the excellent entertainers. I would give a 5* rating for the amazing 'Corinne Oliver show'. They arrived promptly and were professional, accommodating and friendly throughout the night.